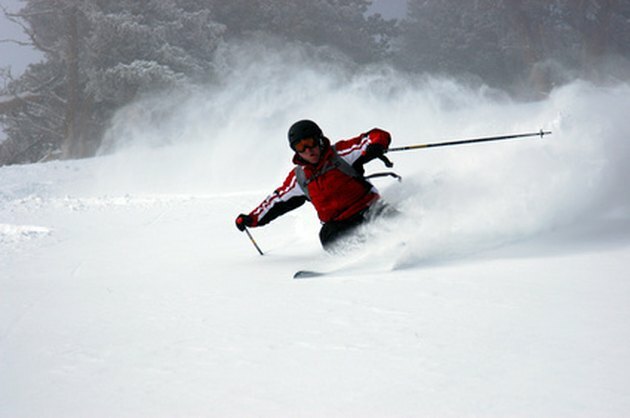 The knee is the most likely part of the body to get injured while skiing and accounts for approximately 45 percent of all ski-related injuries, according to the Sports Injury Clinic. The knee joint is composed entirely of ligaments but is reinforced by the tendons of the quadriceps and hamstring muscles. To protect your knee while skiing, you should begin a program to improve the strength and endurance of these muscles for eight to 12 weeks before you hit the slopes. The squat is one of the most effective exercises for improving leg strength. It specifically targets the quadriceps and hamstring muscles. Stand with your legs shoulder width apart and a loaded barbell resting across your upper back and shoulders. To keep the barbell in place, secure it with a firm overhand grip and keep your hands at a comfortable width. Contract your core, slightly arch your back and look straight ahead as you bend at the hips and knees to lower down into a squat. As soon as your thighs reach horizontal, straighten your legs and lift your torso to return to the starting position. To prevent injury, refrain from rounding your back at anytime throughout the movement. Perform three sets of 8 to 12 repetitions with a challenging weight. The wall sit is an exercise that requires your leg muscles to maintain a static contraction for a period of time. This exercise will help to improve strength and endurance in your quadriceps muscles. Stand with your back flat against a wall. Slowly walk your feet out until your heels are two feet from the wall. Gently bend at the waist to lower your body down the wall until your thighs are parallel with the floor and you have a 90-degree bend in your knees. With your torso erect and your core stabilized, hold this position for 30 seconds before pushing yourself up to the starting position. Perform three to four sets of this exercise. As your strength and stamina improve, progressively increase your hold time. The lunge effectively works the quadriceps muscles. Stand with your legs slightly apart and hold a dumbbell in each hand. Keeping the torso erect and your core stabilized, take a big step forward. Lower into your forward leg until that thigh reaches horizontal. Push through your forward heel to return to the starting position. Repeat the movement on the other leg. To prevent injury, it is crucial to ensure that your forward knee is always lined up directly over your ankle through out the entire movement. Don't allow your knee to veer inward or outward. Complete three sets of 8 to 12 repetitions. The lateral box jump is a plyometric exercise that allows you to explosively move in a manner similar to that on a ski slope. Stand next to a 12- to 20-inch box with your feet shoulder-width apart. Lower down into a half-squat position and immediately jump up onto the box. Do your best to land softly on the box so as not to cause excess stress on your knees. Step off the box to the other side and repeat the movement. Complete three sets of 5 to 10 repetitions. The squat jump is another great lower body plyometric exercise that targets the quadriceps and hamstrings. The dynamic explosive movement produced by this exercise will dramatically improve the overall muscular fitness of your legs. Stand with your feet shoulder width apart, your torso flexed slightly forward and your back straight. Hold your arms flexed at 90-degree angels at your sides. Bend at the waist and knees to lower into a squat position. Continue down until your thighs become parallel with the floor. Immediately explode upwards as high as you can, using your arms to add to your momentum. Land softly on both feet and then immediately repeat the movement. Due to the eccentric loading that occurs during this exercise, you should never get carried away with excess reps or you will experience severe muscle soreness. When you begin your training program perform two to three sets of 5 to 10 repetitions. As your fitness level improves, you can add repetitions to your workout.